This exhibition is an opportunity for furniture manufacturers to display their products to area educators, architects, and other members off the design community. The exhibit will be organized by space type, (Classrooms, STEM, Collaboration, Library, Admin, Dining, Specialty, etc.). Manufacturers and distributors are encouraged to purchase booth space based on the category or categories that best align with their products. Although space is limited, exhibitors can purchase more than one booth. Admission for school district personnel and all those registered for the conference will be free of charge. Admission for the design community who wish to only attend the exhibition will be a $50 fee. 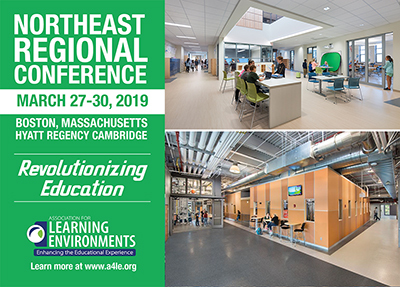 Cancellations must be requested in writing and received at the Association for Learning Environments no later than February 28, 2019. Refunds will be sent after the conference, less a $50 cancellation fee. You may transfer the registration to a colleague free of charge. Send your requests to Edi Francesconi at edi@a4le.org.